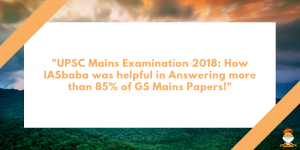 Home » Blog » UPSC Mains Examination 2017: How IASbaba was helpful in Answering 85% of GS Mains Papers! It is cliche to say that UPSC is unpredictable. Of course, it is! Everyone knows that. But what unpredictability are we talking about? Is it about the pattern? Well, that changes every now and then. In fact, this aspect of UPSC has become predictable of sorts! The fact of the matter is that pattern, questions, word limit etc do change every year but that dear friends is not unpredictability. What is really unpredictable is the demand of UPSC. What exactly does UPSC want from an aspirant? Should an aspirant have critical thinking or must she possess the attributes of an honest civil servant? Should the candidates have the ability to memorise and reproduce information or should they be able to think and create a response at will? Does UPSC want to check your knowledge or does it only want to test your integrity? Being the ardent UPSC aspirants you are, the obvious response from you would be a mix of all the above! Isn’t it? But is that the case? 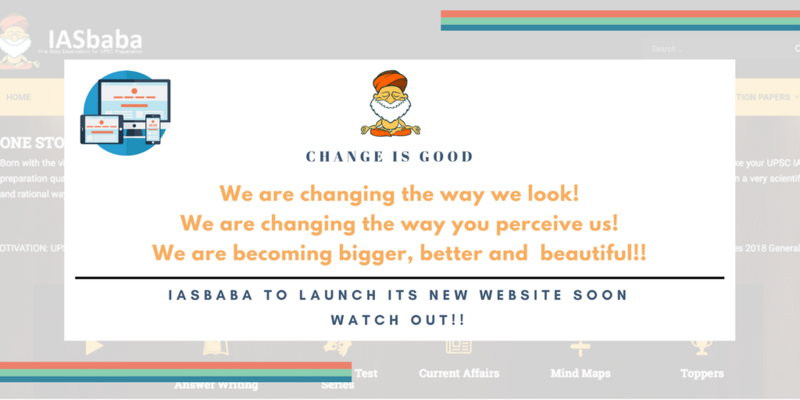 We at IASbaba think differently. We believe that UPSC just wants to see your ability to adapt. How exactly do you respond to unlikely and difficult situations? How do you tackle a tricky scenario? How do you think vis a vis others in similar conditions posed with same problems? At the end of the day, what UPSC does is a comparative analysis of your performance. Even if you score less marks in paper 4 but somehow manage to sneak into the top 1000, UPSC can’t reject you. Is there a pre-decided cut-off in Mains or interview? No. There isn’t. So ultimately everything boils down to your ability to adapt better than others. You just have to be the least stupid candidate (don’t get offended by the choice of word). There is no absolute measurement of your performance. Its all about the way you respond to a change, the way you change your approach and the way you sync your mind, heart and soul to the demand of UPSC every year. But after all, its easier said than done. How does one adapt? What are the tools that can help one guide in changed conditions? Well, the answer lies in the game of Cricket. Of all the great Indian batsmen, the one who stands tall and garners respect from all the quarters is Rahul Dravid. While Sachin was a genius, Dravid was a fighter. He had this uncanny ability to adapt to any condition and perform despite all the odds. He could tackle spin in a dustbowl and overcome swing on a seaming wicket not only in India but anywhere in the world. That made him great. He once took 40 deliveries to open his account against Australia! That is the mark of his temperament and perseverance. People used to joke that he should be made the defence minister keeping in mind his superb defence! But then he tasted success everywhere making him the most successful player in overseas conditions. He adapted with ease and adapted to win. UPSC wants that from you also. In a traditional community that civil service aspirants belong to, the ability to transform has vanished. From thinking individuals of yesterday, aspirants have turned into internet scholars who can search, research and discover any information but hardly possess the ability to analyse them. That’s the sad truth. You have started to prepare according to the pattern (which changes almost every year) whereas your preparation should be pattern proof. Questions, marks, word limit etc are nothing but a means to check your knowledge. You should focus on getting that knowledge and not bother about the pattern much. You should also have the temperament to be defensive in a hostile scenario. GS Paper I was difficult this year and that must have led to three sets of people. The first would have filled the sheets irrespective of their lack of information and felt satisfied. The second would have left the difficult ones and started thinking about their next attempt already. The third set of aspirants are those who must have ducked the difficult ones and given their 100% to the ones that they knew. After coming out from the examination hall, they would have started to think about the next paper not worrying about the previous one. See the difference here. Even though the performance of the third set of aspirants would be poor by absolute standards, it would be better than the other two. Why? Simply because they could adapt. They could manage the temptation to attempt the unknown questions. They were clinical in their approach, just like Dravid. This examination is such that it requires peace of mind and the commitment to adapt to any situation. Read and think later. Think and contemplate later. Contemplate and evolve later. Evolve and execute later. Execute and succeed finally. That’s the mantra of success in UPSC. If you qualify the Civil Services Examination, you will get the opportunity to work as an administrator in public life. You will have many duties to perform, and very often you might be faced with ethical dilemmas. In the context of the scenario explained herein, do you have a role model to follow? Which famous philosopher/ leader/ administrator you would derive inspiration from? Why? Will you conduct yourself in an ethical manner even if the consequences of your actions are against national interests? Substantiate your response by taking an example. “A lack of transparency results in distrust and a deep sense of insecurity.” Examine the statement in the context of governance in India. Accountability is the glue that ties commitment to results. Do you agree? Discuss by giving examples. Why are values like impartiality, non-partisanship and objectivity fundamental to the civil services? Why can’t a civil servant discharge his duties without having these values? Substantiate by taking an example. What imparts the characteristics of ‘services’ to civil services in India? Examine with the help of suitable examples. Discuss the ideas of Swami Vivekanand about youth and patriotism. How relevant are his ideas today? Analyse. There is a general perception that people with impeccable integrity can’t survive long in the public services. What is your assessment of this perception? Substantiate. Lack of high pay packages and perks is often given as a justification for illegal gratification. Is it against the very concept of public service? Examine. How do you convince a constable to remain honest in a salary that might be grossly inadequate to fulfill even his basic needs? What do you understand by the principle of trusteeship? What significance does it hold today? Financial institutions, the corporate world and civil society – all must uphold high standards of probity in their working. Only a genuine partnership between the Government and its people can bring about positive change to create a just society. Today success is valued by the height of one’s achievements. It puts a lot of pressure on individuals. Everyone appears to be fiercely competitive to outperform each other to become successful in the eyes of the society. In this context, how relevant is the quote provided below? “If a country is to be corruption free and become a nation of beautiful minds, I strongly feel there are three key societal members who can make a difference. They are the father, the mother and the teacher.” Comment on this famous quote by Dr. APJ Abdul Kalam. Why should an administrator have emotionally balanced mind? Examine. Also, give suitable examples to illustrate your point of view. Social values are more important than economic values. Discuss the above statement with examples in the context of inclusive growth of a nation. Why is it important to have a healthy work culture in an organisation? Do you think government organisations usually lack a healthy work environment? Examine. Government departments need to reinvent themselves with respect to their work culture. Do you agree? Will it have any effect on delivery of public services rendered by the departments. If you are given an opportunity to lead a government initiative, how would you balance between bureaucratic compulsions that lead to delays and urgent needs of the poor requiring immediate attention? Discuss. The Indian constitution has set high moral standards for public life. Do you agree? Substantiate. Means are as important as ends in ethics. Do you agree? Elucidate. The salary and perks of civil servants are not commensurate with the amount of work and responsibilities that they are burdened with. Do you think the concept of ‘public service’ needs a relook in this regard? Examine. The most important instrument of social empowerment is the Right to Information (RTI). Do you agree? Also discuss the significance of transparency in governance. Why having a healthy savings rate is essential for a developing economy. Where does India stand on this front? Examine. The labour market ecosystem in India has witnessed many structural changes that include- increasing use of contract labour, competitive federalism and relocation of labour-intensive manufacturing to smaller cities. Can these changes ensure the growth of productive employment in the economy? Evaluate. Discuss the significance of small airports in India. How they can become engines of growth for the economy? Discuss. Examine the factors behind the ongoing agrarian crisis in India. What can be its remedy? Discuss. The food processing sector in India has got immense potential and the government has taken many initiatives to tap the same. In this light, examine the need, objective and significance of the SAMPAN scheme for the food processing industry in India. What are the demand drivers for the food processing industry in India? Also, discuss the present set of challenges being faced by the industry. Discuss India’s recent advances on the space front. Should commercialization of India’s space programme be promoted? Give your views. The cybersecurity ecosystem in the country requires to be more robust and agile in order to realise the objectives of Digital India. In view of the statement, examine the necessity of having a National Encryption Policy. What has been the recent controversy over the draft National Encryption Policy? Discuss the reasons behind the ongoing crisis in Nagaland. Why does North East India remain a theatre of political crisis even after 70 years of independence? Analyse. Budget 2017-18 and agriculture- The ‘Transform, Energise and Clean India’ TEC agenda of budget may seem like a new term but is, in fact, a continuation of various earlier initiatives of the Government. What budgeting reforms have been taken in the latest budget? Discuss. What is inclusive growth? Explain. Also comment on the Government schemes which intend to bridge the inclusion gap. Social values are more important than economic values. 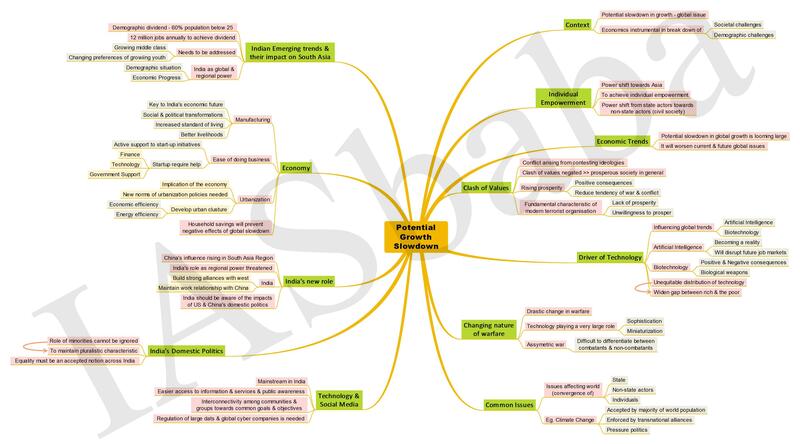 Discuss the above statement with examples in the context of the inclusive growth of a nation. India being an agrarian country is suffering from Agricultural pollution. How is agriculture responsible for degradation of land, air and water? What measures can be taken to reduce it? Critically analyse Centre’s crop insurance schemes, their performance and further scope for improvement. Agricultural subsidies not only distort the market but also have serious implications for the environment. Examine. What are the demand drivers for the food processing industry in India? Also discuss the present set of challenges being faced by the industry. What triggers a tsunami? Discuss at least four factors that lead to tsunami-genesis. Also explain the effects of tsunami in the coastal regions. There is a thin line between collective bargaining and mob extortion. Examine the given statement in the light of the role played by pressure groups in India. What are the sources of terror financing? Examine the nexus between terrorism and organised crime. What steps have been taken to stifle terror financing in India? Discuss. Terrorism has changed in reach, scale and methodologies, thereby exacerbating its threat. Comment. The Big Picture – Judicial Appointments- Why is it Still Eluding Solution? The Big Picture – Simultaneous Elections: Is it Legally and Practically Possible? Pressure groups and their roles in a democracy are not always unharmful. Do you agree? What are the fallouts of having notorious pressure groups in a democratic polity? Examine with the help of suitable examples. The nature and role of pressure groups have changed in the last decade. Do you agree? Substantiate. In a recent move, Public Account Committee (PAC) had intended for bringing about a legislative change to make the Comptroller and Auditor General (CAG) accountable to the Parliament. Critically examine the consequences if this decision is carried out in India. What is hidden hunger? What steps have been taken to address it? Discuss. RSTV- The Big Picture: Eradication of Poverty: What Steps need to be taken to Achieve this Goal? RSTV- The Big Picture: Should India Recalibrate its China Policy? Certain electoral reforms were introduced by Budget, 2017. Comment on their features, suitability and adequacy in India’s current democratic context. SHGs in India are the living embodiment of a concept that has led to women empowerment. However, the success stories are few and far in between. Do you agree? Do you think the successful models of SHGs should be adopted on a much wider scale? What are the constraints? In the quest for financial inclusion, SHGs have played a prominent role in India. Examine the guiding principles of the working of SHGs in the area of financial inclusion. Universal Basic Income: is it coming to India? Lateral entry into the civil services is a step in the right direction. However, the rigid bureaucratic superstructure of India needs overhauling before such entry is allowed. Comment. The structural change in the global energy market has contributed to the changing paradigm of West Asian strategic thinking. Discuss. In this light, examine the approach that India has adopted to cultivate ties with this region of the world. Is diaspora important? Substantiate by taking suitable examples. The recent visits of the PM abroad have indicated a more inclusive policy for the Indian Diaspora. Analyze the role of the Indian Diaspora in India’s soft power diplomacy. The economic life in 18th century India had imprints of the contemporary political scenario of the country. Examine. Why the nationalist movement during 1885 to 1905 is branded as the moderate phase? Discuss. Did the moderate phase achieve any success? Critically examine. Discuss the significance of coal as an energy resource. What reforms are needed to cure the ailing coal sector? Regionalism has various strands in India. Do you agree? Substantiate by giving suitable examples. Regionalism in the Indian context hasn’t necessarily been a bad experience. Critically comment. Tribal rights can’t be pushed aside in the name of development. What do you understand by ‘tribal rights’? From where do these rights come? Why they need to be protected? Elaborate. The nature of the struggle for women’s issues has been changing with time. Draw a comparison between the nature of movements centered around women in the 19th century India and post-independence India. What is secularism? Discuss the concept of communalism as a threat to secularism. The ongoing layoffs in IT firms is a disturbing signal for the economy. Do you agree? Critically analyse. We are happy to announce and share with you certain things and one of them is our NEW WEBSITE in the offing. Second is the New TLP Mains Answer Writing 2018 Phase I to be started very soon. Third, is a surprise to be disclosed in a few days.